Cost is $200 per person, per clinic. Polo School is $3,500 for adults 18 and $3,250 for juniors ages 10-17. Have a busy schedule? We offer Private Polo Lessons! Too busy for a set schedule or prefer one on one riding instruction? 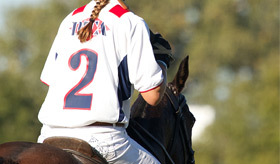 Our USPA certified Instructors offer one on one polo lessons for juniors and adults. Stick with a polo lesson plan and you could be riding in the following season polo league! Offer good from June 1, 2018 thru September 1, 2018. Offer good for newcomers/non members only.